High Street Tattoo’s Joey Knuckles and The Ohio State Fair proudly bring you our Third Annual Ohio’s Best Tattoo competition at the annual Ohio State Fair. July 31st, 2017, located in the Showcase Pavilion. Registration begins at 12pm and the event runs from 4:00 pm-6:30pm. High Street Tattoo brings its second annual competition to the bustling Ohio State Fair in a meticulous search for the world’s best tattoos! We’ve searched far and wide from every corner of this Earth’s vast open expanse to proudly present a competition of epic proportions! The finest, most finessed lines! The most vibrant, dynamic colors! The most compositionally sound designs that intricately follow the flow of the human form! Come join High Street Tattoo, the Ohio state Fair, and the Short North’s most charismatic character as the event’s emcee, Joey Knuckles, as we exhibit the world’s most magnificent artistry on the canvas of the human body! Accompany us to a tattoo extravaganza that will leave your jaw on the floor and awe permanently engraved into your eyeballs! Prizes and awards will be presented to all the winners. So, be prepared for a spectacle of splendor in a wonderland of visual grandeur. 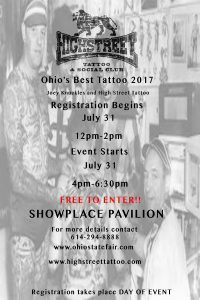 The 2016 Ohio’s Best Tattoo Competition begins at 5:00pm, 8/1, at the Showplace Pavilion at the Ohio State Fair shortly after the Old Familiar Beard Bash. So, if you think that your tattoo has what it takes to win amongst a veritable pantheon of creative beauty, then stop by and compete. Registration begins at 12:oopm. We look forward to seeing you there! Welcome to High Street Tattoo’s new website!